WAPAKONETA, Ohio — A group of engineering students from Ohio Northern University in Ada, Ohio, arrived last week at the Armstrong Air & Space Museum in Wapakoneta, Ohio. While lots of people their age spend time with their heads under the hoods of hot rods, hoping to become fast and furious, this group drove up to the front door of the museum, at the dizzying speed of 10 miles per hour, in an Apollo Lunar Rover – a replica they built themselves. The students were marking the end of a three-year journey by delivering the rover to officials at the museum, where it will be used as an eye-catching showpiece for the museum’s public outreach activities. The museum that celebrates Wapakoneta’s hometown hero, Neil A. Armstrong, the first man to walk on the Moon, is probably the perfect home for the rover. 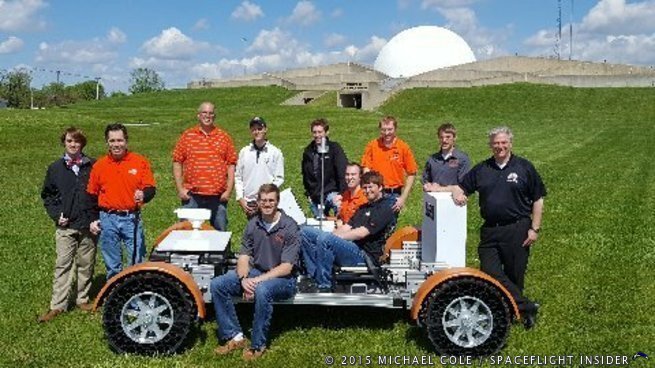 The replica Lunar Rover, or Apollo Lunar Roving Vehicle, is the product of a special program at ONU’s College of Engineering. The program is called Engineering Projects in Community Service, or EPICS. The program presents teams of undergraduate engineering students with opportunities to design, build, and deploy real systems to solve engineering-based problems for local communities and education organizations. Their past projects have ranged from upgrading the scope of community websites, to a civil engineering project to move, restore, and display a historic church bell. The Lunar Rover EPIC project was a unique one that had a precursor and one that owed its existence to a previous EPIC project for the Armstrong Air & Space Museum. To add a display to the museum that expanded its attention to the story of Mars exploration, an EPIC project started in 2012 produced a 1/5 scale working model of the Mars Science Laboratory Curiosity rover. Following that successful partnership, a new group of students met with museum director Chris Burton in 2014 to discuss other projects the students could possibly do for the museum, one of the ideas was a replica Apollo Lunar Rover. The students answered that question when they delivered the rover replica to the museum on Thursday, May 5. With the kind of can-do spirit that sent U.S. spacecraft, astronauts, and Lunar Rovers to the Moon in the first place, the students attacked the project with energy and determination. They were aided in the project by a group of professors, as well as the Dean of the ONU College of Engineering, Eric Baumgartner. Baumgartner knows a thing or two about rovers. During his time at NASA’s Jet Propulsion Laboratory (JPL) in Pasadena, California, he spent eight months living on Mars-time as one of the drivers of the Mars Exploration Rover Opportunity. The students did some testing of their Lunar Rover when they delivered it to the museum staff. The gusty winds that afternoon proved to be too much for the umbrella-like antenna on the rover, so it was set aside and stowed. Of course, this was never an issue with the real rover on the Moon, where there is no wind (and virtually no appreciable atmosphere). The students needed to keep the differences between the Earth and the Moon in mind at all times. Throughout the project, the students had to strike a balance between recreating the rover as accurately as possible, yet remembering that the replica had to be structurally functional for working in Earth’s gravity. One important Earthly condition the replica needed to be prepared for is… parades. It will essentially become its own summer parade float and is likely to provide a lot of attention for the museum. For now, the rover replica must be stored at the museum in a garage, where it can be brought out for special events. However, a plan is in the works to give it a permanent place and display. The Ohio capital budget bill that includes the funds for the museum has so far passed both the Ohio House and Senate Finance committees with the monies for the museum intact. 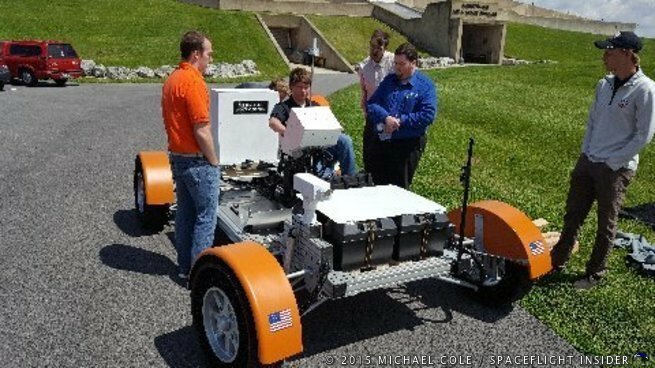 The rover replica by the ONU students and the monies from the State of Ohio, and, hopefully, other monies in the future, are part of the museum’s effort to prepare for 2019, the 50th anniversary of Neil Armstrong’s stroll on the lunar surface.